A West Island woman with stage IV cancer has been forced to battle bureaucracy, as well as her disease. Quebec's health insurance board initially refused to pay for a treatment recommended by her oncologist - a treatment she couldn't live without. Only two months after she got married, Rosemarie Elisan developed a strange cough. “That cough is not normal for me, so I went to the walk-in clinic and she gave me antibiotics,” she explained. When various treatments failed, the 44-year-old woman requested an x-ray. Elisan was then told she had stage IV cancer that spread to her brain. “Rosemarie has a lung cancer with a special mutation - it's an EGFR mutated lung cancer, its driven by only a single mutation on EGFR, and she needs special targeted treatment,” said Dr. Marie Florescu, oncologist at the CHUM. When the first treatment caused too many side effects, the dose was lowered. The only option was for the couple to buy the targeted treatment Tagrisso themselves - but it was of reach. “Who can afford $10,000 a month? That's why I told my husband, I don't know what to do, I don't know,” Elisan said. So Florescu applied to a special Quebec health insurance board program that sometimes makes exceptions and pays for treatments not covered by Medicare. The oncologist couldn't prove Rosemarie had the necessary mutation, and a brain biopsy was too risky. “She needs the drug today, she doesn't need it in six months or 12 months, if it continues to spread to the brain - she will die,” Florescu explained. The specialist made two formal requests to RAMQ, laying out the case. After two rejections, the doctor sent a third appeal and the couples' MNA Greg Kelley even spoke up on her behalf. Just two hours after CTV Montreal’s interview with the couple, Nick and Rosemarie got the news from RAMQ that the government will pay for Rosemarie's much needed treatment after all. The Tagrisso tablets are expected to extend her life. But Florescu says it shouldn't be so difficult to get a request approved when the science is sound. “You know, it's like they're not listening to this special case this special situation that's why it's so frustrating,” she said. Florescu thinks RAMQ could improve the process by communicating with the doctor by phone instead of just by mail, and also perhaps by instituting a peer review system, whereby an independent oncologist participates in the decision making process. 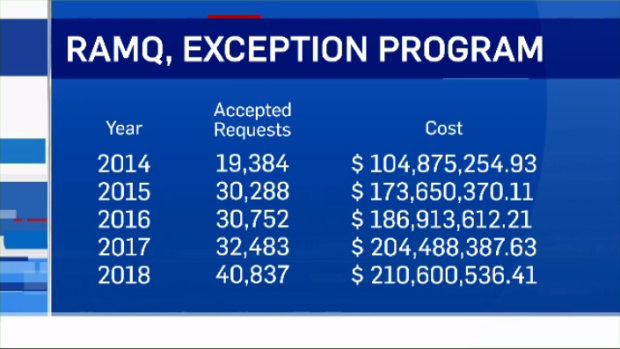 On the other hand, she points out that Quebec is the only province that has this kind of a program that makes exceptions for patients. According to RAMQ, in 2014 it accepted more than 19,000 requests to cover uninsured medications - a cost of more than $104 million. By 2018, the number of patients granted exceptions doubled to more than 40,000. Elisan is very grateful she made the 2019 list. “I want to be well that's all, I want to be well,” she said.